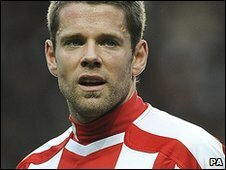 Stoke striker James Beattie is considering a move away from the club following a bust-up with manager Tony Pulis, BBC Sport understands. It was alleged Pulis and Beattie had to be separated in the dressing room after Saturday's defeat by Arsenal. On Monday Stoke said they would hold an investigation, but contrary to reports, Beattie has not apologised to Pulis. The 31-year-old has 18 months left on his current contract, having arrived at the Britannia Stadium in January, 2009. Beattie did not train with the rest of the Stoke squad on Monday, though he did spend around 30 minutes at the club's training ground before departing. And BBC 5 live's Dan Roan reported: "I've been told by sources very close to the player that contrary to reports James Beattie has most definitely not apologised to Tony Pulis, nor does he feel the need to following a bust-up between the pair at the Emirates on Saturday. "Furthermore his future at Stoke is now in the balance and there is, I'm told, every chance he has played his last game for the club. "The dispute occurred following the club's 2-0 defeat to Arsenal. Pulis told his players he expected them to train on Monday despite a prior agreement giving them a day off to attend a Christmas party." Roan added that Pulis and Beattie had to pulled apart following the incident. "Pulis apologised to the entire squad on Monday but today, amid reports Beattie himself had said sorry to the manager, the disagreement appears to have intensified again and it could now lead to the player leaving the club in January," he said. Beattie became a big favourite at the club when his seven goals during last season's run-in played a significant part in keeping the club in the Premier League. And while he has only scored twice this season, in October's 2-1 win over West Ham, Beattie has again been a key member of a squad that currently sits in 11th, seven points off the relegation zone.